We’d love your help. Let us know what’s wrong with this preview of Senior Year Bites by J.A. Campbell. Vampires might stalk pop culture, but they’re just myth Senior year is supposed to be fun: boys, dances and graduation. It’s significantly harder to enjoy it when you’re dead. To ask other readers questions about Senior Year Bites, please sign up. This is the first book in the series, and it is about 180ish pages long. This is a new author for me. I always try to read a mix of YA stuff just in case a student needs suggestions for something they might like to read. This book started slow for me, but this is usually a me issue when I start a new series and trying to My Thoughts - 4 out of 5 Unicorns - I really liked it!!! Meg is facing her senior year in high school but she isn't worried about grades, boys and graduation like most senior are. No she's worried about keeping her secret from her mom, her friends, really from everyone. The secret that started the night she played truth or dare at her best friends party. Afraid of telling truths, she agreed to stay the night in the nearby graveyard. Attacked and left ... well dead, Meg survived the night figuring out slowly that her problems with sunlight and craving for blood only meant one thing. She hadn't survived alive. Now she tries to hide the truth from everyone. Harder to do now that there are strange unexplained murders turning up in their sleepy little town. She wasn't responsible, was she? Senior Year Bites holds most of the classic lure for vampires: sunlight, drinking blood, pale skin, no heart beat,- you get the drill. It is different in that it's only direct sunlight that burns Meg, though she's more comfortable in the night. I think the world building was okay. Meg's ability to figure out how to use her vampire powers was a little strange. Once she was made aware of she had a power, she just tried and there it was. I wondered why she had to be told about those powers if they were so easy to use. I Liked Meg. She was strong and tried to protect her family from what she had become. She tried to do the right thing when she realized someone was killing people. Her ties to her friends were strong and I loved that her friends stood by her. I liked her brother's character a lot but I wish there had been more for him. Things that frustrated me about this book include never finding out who turned her or why, never finding out ... well that one's too spoiler to say and Meg never telling her family. I would have enjoyed the book more if there was resolution to a few points that just aren't dealt with in the book. I always hope that characters grow and I wish Meg had made a little more progress by the end of the book. This is more of a classic vampire story. Very little to no romance in this book. I guess I have come to think of paranormal and romance as going together but this book is not that way. So if you like your vampires traditional and wish the romance would stay in the romance books, then this one may be a good fit for you. It's been a bit since I've read a book dealing with vampires, but I'm glad I got to read this one. Senior Year Bites is a fun read. A fresh take on vampires and other supernatural creatures. Meg is a vampire, only she doesn't know how she got that way. Say what!? Yeah, I told you it was a fresh take. So, sunlight irritates the crap outta her, no she doesn't sparkle and yes she likes blood. The journey begins in the beginning of the story, so no hashing through crap in order to get to the good st It's been a bit since I've read a book dealing with vampires, but I'm glad I got to read this one. Senior Year Bites is a fun read. A fresh take on vampires and other supernatural creatures. Meg is a vampire, only she doesn't know how she got that way. Say what!? Yeah, I told you it was a fresh take. So, sunlight irritates the crap outta her, no she doesn't sparkle and yes she likes blood. The journey begins in the beginning of the story, so no hashing through crap in order to get to the good stuff... so to speak. Teaser: I wondered what her name was. Though I could identify her by her reek, I didn't think either Steph or Ann would appreciate me calling her "reeks of lavender" out loud. That was almost too much, even for me. I had to believe in vampires, but I couldn't help picturing Tinker Bell flying around and sprinkling faerie dust on people that had been killed. I snorted. I've been a fan of Campbell's writing since her first installment of her "Into the West" series (and I'm impatiently waiting for the last two installments.) This book has similarities in style to that short story series: a minimum of angst (though there's more in this one, but it's not overdone), humor, an easy, light way of writing, and teens who are a little bit goody two shoes but believable. She also avoids details that might date the story - music, cars, clothes, etc are not referred to by brand except generically ie Meg drives a Jeep but that's all the detail we get. I like that sparseness, there's enough detail to visualize what's happening and fill in the blanks but she doesn't drown you in detail or get all trendy or drop names. The focus is the story and the characters. The main characters are Meg and her friends, who are high school students and college students; what few adults we see have little page time. I was somewhat disappointed actually that we didn't see more of Meg's mother. We're told, often, how worried she is and we see her worry but we learn little about her and her interactions with Meg are mostly "honey, why aren't you eating?" (she doesn't know that Meg's a vampire now), "you're so tired these days" and "Yes, you can go to a sleepover at Steph's" house. The focus is on the teen characters but I really would have liked more depth to the adults. That aside, I really enjoyed this book. The story starts after Meg has been bitten. Her attacker didn't stick around but took off and Meg is taking the sink or swim course in learning how to be a vampire. Later in the story she gets help from an unexpected source. Meg has a lot to learn - how to live as vampire (simple things like remembering to wear her coat while outside in the middle of winter are a challenge for her), dealing with her family, friends, and even high school as a vampire, and, when a supernatural killer comes to town and starts targeting her food ie humans that she's fed from, she grapples with hunting him down and embracing her inner vampire. The scene near the end, where she lets lets her vampire self have full reign in dealing with the killer, is both bittersweet and victorious. She stops the killer and saves her friends but has to let go of a piece of her humanity to do so. As the story goes along, Meg's friends also have to learn how to cope with her and their relationships change. They also collect some new acquaintances and form an updated Scooby Doo gang, inspired more by Buffy's version than the original, cartoon version. The interactions are enjoyable and come off as believable, something that can be challenging for YA authors. The world building is light, but she's working on the next book so we may see more in that one. The supernatural world in this book is has vampires and faerie so far; I hope will see more supernatural species, maybe werewolves (bats eyelashes), in future books. We get a glimpse of the faerie world via one of the characters, who also gives us, and Meg, info about vampires. The faerie, who seem to be traditionally based, and vampires, who also seem to have traditional characteristics, do not get along. At first, he doesn't trust Meg, simply because she's a vampire and she dislikes him, he makes the hair on her neck rise and she's suspicious of his relationship with her friend Ann. The story is set in New England but there's little of a New England feel to the story; it really felt as if it could have happened in any state in the US that has four seasons. (I live in New England and have for most of my life) Also, the school closing for heavy snow was unlikely in the manner in which it happened. The sparseness of details, which I mostly like, may have contributed to the lack of place; I don't know how much research she did but I know she has researched the setting for the next one. There were some loose ends at the end of the story - Why does Ann speak in a somewhat unnatural, very formal manner? ("It is okay. She is very self-centered. Candice is much better." and "Okay, then we will not have to fight traffic.") What's the connection between the group of teenagers, including Ann's new friends, who moved here simultaneously, and at the same time as Meg's "accident", and recent events? Is there a connection or is it just a red herring? Why did the killer change focus from targeting Meg's victims to girls who resembled Ann? Was Alexander just using Ann to get to Meg? I hope these will be addressed in the next book. When you get down to it, despite my quibbles, I enjoyed this book and have read it several times now. I like the characters, her mix of vampires and faerie, her style and the overall story. I wanted to read Senior Year Bites because I thought it would be similar to a YA version of Chloe Neill's Chicagoland Vampires series, especially since it seemed like play on the second book, Friday Night Bites . Overall, I enjoyed Senior Year Bites . It was a lot of fun and a really quick read. I stayed up a little late to finish reading it, because I wanted to see what happened. I had a few issues, but I still ended the book with a smile on my face. Most of my problems were that there were I wanted to read Senior Year Bites because I thought it would be similar to a YA version of Chloe Neill's Chicagoland Vampires series, especially since it seemed like play on the second book, Friday Night Bites . High school can be bad enough, but what if you're turned into a vampire too? I loved this novel, sort of a manual on how to deal with suddenly becoming a vampire in high school. How do you cope? What about your family and friends. Wonderful story on how to turn a bad situation into a good one. Vampires can be heroes too. Definitely recommend. This is not the worst vampire story I've read but it's definitely not the best either. It had promise and a sturdy storyline but what really got me was the sudden acceptance with John, just believing what the group talks about. Megan is a senior in high school and attends a slumber party with a group of high school friends. During the slumber party they decide to play 'Truth or Dare' and as a result, Megan must spend the night in a nearby graveyard. During her night at the graveyard she blacks out and wakes later with two very serious problems. Problem number one is that she is dead and problem number two is that she has fangs. I really enjoyed this novel. Plenty of action throughout but the further into the novel you g Megan is a senior in high school and attends a slumber party with a group of high school friends. During the slumber party they decide to play 'Truth or Dare' and as a result, Megan must spend the night in a nearby graveyard. During her night at the graveyard she blacks out and wakes later with two very serious problems. Problem number one is that she is dead and problem number two is that she has fangs. I really enjoyed this novel. Plenty of action throughout but the further into the novel you get the more you can relate to the characters and the plot. This was fun and gripping--the characters were great and the plot was tight. Meg is genuine and smart, Steph and Ann are great friends and their loyalty to each other was refreshing. The characters that Meg ended up meeting as a result of her transformation were unexpected and turned out to be pretty awesome--I loved the way her new friends rallied around her. The story has good layers and an excellent ending. I look forward to reading the rest of the series. Gentle Reader Alert: There is some la This was fun and gripping--the characters were great and the plot was tight. Meg is genuine and smart, Steph and Ann are great friends and their loyalty to each other was refreshing. The characters that Meg ended up meeting as a result of her transformation were unexpected and turned out to be pretty awesome--I loved the way her new friends rallied around her. The story has good layers and an excellent ending. I look forward to reading the rest of the series. This idea had potential but this book was lacking- thank goodness it was free. The character development was weak, the story dove straight into the plot, and the plot itself was thin. The interactions between characters was weak and choppy. Also Ann’s character “quirk” of never using contractions would be more effective if she refused to use any contractions but she does. It makes her hard to relate to and unbelievable. The characters needed more individual voices. That being said there were some This idea had potential but this book was lacking- thank goodness it was free. I guess I never added this one to my Goodreads list because I read a beta copy and it hadn't been added to GR yet. Still, I really enjoyed the book, and think it's about time for a re-read of the series. At first I wondered about this story but then I was pulled in and couldn't stop. It was a good and enjoyable read. Meg comes to an understanding of what she's become and tries to deal with it on her own. Afterall there isn't anyone around that would give her any easy answers. She learns how to hunt for food and is slowly learning about some of her newfound abilities - the strength, the whole mind power thing, the extra speed. Of course Meg tries to keep it all a secret, but her mom and friends are beginning to be suspicious of her new behavior and sleep habits. Around this time, strangers appear in town - one of them forms a friendship with one of her best friends. Then, suddenly, some of the food her blood "donators" - donators that Meg had made sure she's left alive and safe- begin to turn up as dead bodies, then things start getting way more complicated and dangerous. I thoroughly enjoyed Senior Year Bites. Ms Campbell's teen characters SOUND like teens. Her adult characters sound like adults, her "other" characters are different. Senior Year Bites is told in first person and I loved Meg's voice. There were times when Meg was surprised at her self and there were times when she was a little disgusted with her self, yet there were no overly angsty moments. Meg is a strong willed young woman, making the best of her situation. One thing I enjoyed was the lack of a love triangle situation - this is a story of a girl made into a vampire; it's refreshing to read a story with out the addition of the seemingly formulaic presence of two boys who are attracted to and fighting for one young woman. In fact, the beginning romance was with a couple of side characters and still did not include extras. Senior Year Bites is the first book in the Clanless Series. It is a teen book but as an adult I seriously enjoyed and couldn’t put it down until I finished it. I’m looking forward to reading book 2 in the series. I had plans for my last year of high school. Meg has just been turned into a vampire and is trying to deal with it, and keeping her school grades up. Admitting to her best friends Steph and Ann the truth about why she’s avoiding them, off sick so often on very sunny days and just plain paler than usual is a relief but not as much as when they accept and support her. But when people are being murdered, people that Meg previously fed from (but left alive) Steph decides they must find the killer. With the help of three college guys, they start patrolling the area to try and find the supernatural killer. But it’s only with the help of Alexander, Ann’s boyfriend they begin to realize the exact danger, they are in. With increasing attacks time is running out, because the killer wants Meg to suffer and die. I needed someone male, alone, and drunk for this to work properly in my head. Getting that close to a girl was something I couldn’t yet bring myself to do. I spotted a potential subject in the back. He appeared to be in his early twenties, cute, and drinking heavily. I started his way and jumped when a hand touched my shoulder. Some cool huntress of the night I was. “Yes?” I turned to face the owner of the hand. Young enough to still be in college, he had dark brown hair and eyes, and a nice tan. His winning smile made me feel butterflies all the way down to my toes. He smiled again, apparently trying to be friendly, but he wasn’t drunk enough to suit my needs. “Hi. I’m Bridget.” I didn’t want to give him my real name. I did smile back, unable to resist his grin. Then what he said clicked. He’d seen me in here before. Damn. Sloppy. It looked like I wasn’t going to find dinner here tonight. “Maybe. It was nice to meet you.” I headed for the door, watching Gary out of the corner of my eye. He went over to a table with a couple other guys his age and gestured once at me before shrugging. I put them out of my mind, hunger driving me to the sports bar and my next meal. FTC Advisory: Jen Wylie provided me with a copy of Senior Year Bites by J.A. Cambell. Published through Untold Press. Kindle Edition. No goody bags, sponsorships, “material connections,” or bribes were exchanged for my review. This book is a fantasy novel by J.A. Campbell for YA. The reader goes back to being a high school senior. You might be hangin' with a couple of your best friends, dreaming about prom, doing that dreaded homework and scarfing down on junk food. Just a normal teenage. Megan goes to a sleepover and takes a\up a dare. Visit the cemetery at night. The all out dreaded dare. Megan goes to the cemetery and gets attacked. She makes it through the attack but doesn't remember much. She doesn't like the sunlight. She sleeps a lot during the day and is having trouble with food.Instead of wanting food, it seems that everybody she knows appeals to her taste buds. Reality settles in on Meghan. She realizes what she is. There is no one to help her, so she is trying to handle this on her own. While she is learning how to deal with this, she knows she must keep it a secret. The trouble is, those close to her are becoming aware that there is something going on with Megan. Then, things become more dangerous when a stranger comes to town. The author wrote a book that has characters that are described to be so realistic. The author didn't go over board with the descriptions. She just made them realistic. They sound like everyday teens. The reader wasn't bogged down with too much information that really wasn't necessary. Sometimes all those adjectives are fill in words. That becomes boring after a while. The book is narrated in first person, Megan. The main character was written to be a strong willed young woman who is trying her best to deal with a very bad situation.The isn't your usual YA book. There aren't two boys seeking one girl's attention. The romance didn't include Megan but a couple of characters that were fill ins. What a wonderful read. The plot is about one main person and that is Megan who becomes a vampire.The story is actually very believable, especially for the readers who are vampire lovers. There are a lot of questions left unanswered, which makes me think there may be a Book Two. The reader is left wanting answers and I hope the author writes another book to answer some of those questions. I loved the tittle of the book. How appropriate. So if you love those blood sucking little devils, grab yourself a copy and enter into the teen age vampire world. I was given a complimentary copy of SENIOR YEAR BITES from the author, G.A.Campbell for my view of the book. No other compensation took place. Everything seems a lot more diff I received this book in exchange for an honest review. Senior Year Bites was a great read! It was filled with excitement and adventure that left me wanting nothing but more more more! The author, J.A. Campbell, really did an awesome job making the story and the character's stand out, while still keeping the story on track. Senior Year Bites was fast paced and action packed and I couldn't put it down! Meg was a great lead. She was witty, sarcastic, strong, and brave. Everything a female protagonist should be. Meg was a really great friend to Steph and Ann. She tried her hardest to protect them from her new life as long as she could, afraid she would lose them. But even after they figured out her secret they stood by her. I loved the secondary characters! Each and every one was a riot to read about. They all had something special about them that made them stand out. Gage was probably my favorite. He was just hilarious in every scene he was in! I loved all the boys, Alexander included, but I couldn't help but think Gage stood out. Senior Year Bites was excellent and I can't wait to start book 2! I would recommend this book to all lovers of the Paranormal and YA. What do you do when you find out you’re a vampire? Well, if you’re Meg, the heroine of J. A. Campbell’s YA novel, Senior Year Bites, you fight the darkness and work toward the light. Not the sunlight you can no longer stand, but the light that means you’re fighting for good. When things don’t turn out exactly the way she planned at first, when the hunger is too strong to let her be any kind of “vampire superhero,” Meg does the next best thing and tries to solve the string of murders happening in What do you do when you find out you’re a vampire? Well, if you’re Meg, the heroine of J. A. Campbell’s YA novel, Senior Year Bites, you fight the darkness and work toward the light. Not the sunlight you can no longer stand, but the light that means you’re fighting for good. When things don’t turn out exactly the way she planned at first, when the hunger is too strong to let her be any kind of “vampire superhero,” Meg does the next best thing and tries to solve the string of murders happening in her small New England town. 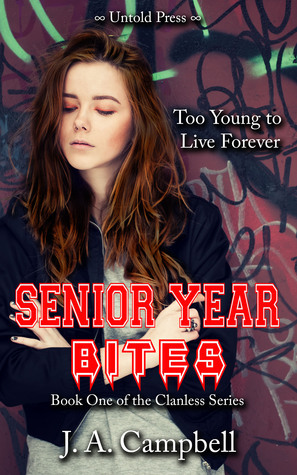 What’s so refreshing about Senior Year Bites is that right away Meg confesses to her core group of friends, who dutifully try to help her cope with what she’s become. I thought that was very refreshing, considering most vamp books employ a lot of cat and mouse -- and sometimes unnecessary -- “games” being played with family and friends. This technique really worked for me! I also like how we kind of start in the middle of this story. Meg realizes she’s a vampire, but we don’t spend pages and chapters rehashing why, or how she got that way or even what it means. Like any teenager, she kind of adapts and overcomes and figures out a way to make good use of her “superpowers.” Oh, with a little help from her friends, that is! I really enjoyed Senior Year Bites. It really loves up to its title, steeping the reader in all the trappings of one’s senior year – the bittersweet endings and anxiety about beginnings – and yet all with a kind of mystery-slash-vampire story as well. What’s not to like?!? This was an enjoyable book. With Meg being turned into a vampire early in the book, I was expecting primarily a vampire story or at least more vampire characters. However, the author threw in multiple twists, introducing other "mythical" creatures into the story, along with a serial killer angle. I thought the characters were decently developed. It was interesting to see how Meg adjusted to her new life, in particular her struggle with having to drink blood but being disgusted by the concept, an This was an enjoyable book. With Meg being turned into a vampire early in the book, I was expecting primarily a vampire story or at least more vampire characters. However, the author threw in multiple twists, introducing other "mythical" creatures into the story, along with a serial killer angle. I thought the characters were decently developed. It was interesting to see how Meg adjusted to her new life, in particular her struggle with having to drink blood but being disgusted by the concept, and having to hide who/what she was from others. I thought the author did a good job of dealing with the reactions of others to finding out what/who Meg was. I also liked how Meg slowly learned about her new powers, sometimes figuring things out by accident. The tense "relationship" with Alexander was a good aspect of the story. Well worth the read. I read the description of this book ages ago and have been impatiently waiting on the release, so I'm glad it's finally out and I was able to get my grubby little hands on it (figuratively since it's an E-Book). I really liked Meg and her friends and was pleasantly surprised by the ending. One little thing that irked me (and it really was a tiny thing) was the way the characters "spoke". They don't use contractions when they speak. Since I tend to "act" the parts out in my head, this was hugely n I read the description of this book ages ago and have been impatiently waiting on the release, so I'm glad it's finally out and I was able to get my grubby little hands on it (figuratively since it's an E-Book). I really liked Meg and her friends and was pleasantly surprised by the ending. One little thing that irked me (and it really was a tiny thing) was the way the characters "spoke". They don't use contractions when they speak. Since I tend to "act" the parts out in my head, this was hugely noticeable to me and started grating a little, the further into the story I got. But again, I think this is purely a personal thing for me, I can see authors writing like this in the actual story but when it comes to the actual "speaking" parts? I don't know anyone that speaks like that so it kind of felt like padding. Oooo! This is one book I won't soon forget! The writing is flawless, engaging, and held me at the end of my seat page after page. From the moment Meg awakes to the last period, JA Campbell took me on an adventure. Meg was a normal teen who is attacked when she answers a dare to sleep in the graveyard. What follows is an amazing journey as she grows into and learns her powers with a very unexpected tutor. I really enjoy vampires, and this particular novel wins the world for me simply because it do Oooo! This is one book I won't soon forget! The writing is flawless, engaging, and held me at the end of my seat page after page. From the moment Meg awakes to the last period, JA Campbell took me on an adventure. Meg was a normal teen who is attacked when she answers a dare to sleep in the graveyard. What follows is an amazing journey as she grows into and learns her powers with a very unexpected tutor. I really enjoy vampires, and this particular novel wins the world for me simply because it doesn't follow the regular cliches, and the humorous details of discovering if the books and movies are right is a delightful treat. JA Campbell also gets high marks for combining otherworldly characters into this vampire tale. This is the true magic of the book for me as I am a huge fan of all things Celtic, most of all the fae. It’s been a bit since I’ve read a book dealing with vampires, but I’m glad I got to read this one. Senior Year Bites is a fun read. A fresh take on vampires and other supernatural creatures. Meg is a vampire, only she doesn’t know how she got that way. Say what!? Yeah, I told you it was a fresh take. So, sunlight irritates the crap outta her, no she doesn’t sparkle and yes she likes blood. The journey begins in the beginning of the story, so no hashing through crap in order to get to the good stuff… so to speak. Megan is a newly made vampire trying to hide her affliction from her mother and finish high school. I thought this book was really clever. The writing is really good. The pacing is good. The book starts with Megan already being a vampire, the explanation is short: she was playing truth or dare, spent the night in a graveyard, died and awoke a vampire. Then the story just moves on with Megan trying to go to school, hide from the sun and find someone to feed her hunger without getting caught. It brings up the question: If you were suddenly made into a vampire, what would you do? Try to go on with your life as if nothing had happened, like Megan? Go off on your own? Try to find other vampires? It is an interesting concept. Later in the book some mysterious things start happening and Megan's story starts to get really exciting. I was enjoying this book a lot. 4 stars. Read this book. Thats my advice. I always worry about vampire books and tend to avoid them. They either seem to be all twinkly and overdone like the twilight series or dark and depressing like those of Anne Rice. Its refreshing to find one where the heroine becomes the vampire yet manages to keep her sense of humour and carries on with her high school education. The plot is intriguing, characters well rounded and it is very fast paced. The only character who seems weak is Ann (she gets worse in book 2 and 3) who i cannot fathom at all. I have to say, I loved reading this book. I enjoyed this fresh new take on vampires...I loved the characters...it was just fun to read. There was some action, lots of drama, a little romance, mystery, humor..just a lot of great components that make up a great, fun book to read!! The main character Meg, is awesome, she wakes up one day a vampire with no idea how she got that way or by whom. She tries to keep it from her friends but falls flat. *I received this book in exchange for an honest review. The main character Meg, is awesome, she wakes up one day a vampire with no idea how she got that way or by whom. She tries to keep it from her friends but falls flat. I loved getting to know Meg and her friends, they are what made this book so great. I highly recommend this book! Campbell is a great author that knows how to take you on an adventure..as my 7 year old puts it....with her writing style. You think your senior year in high school was stressful? Try finding out that you're a vampire without knowing how, when or where it happened, and you were given no instructions. Thankfully you have accepting friends who help you understand your powers and help you to develop them. One day you're going to English class or sitting in the hallway eating lunch with your friends, and the next day you're saving those friends and yourself from the powerful and deadly Unseelie. This book was a lot of fu You think your senior year in high school was stressful? Try finding out that you're a vampire without knowing how, when or where it happened, and you were given no instructions. Thankfully you have accepting friends who help you understand your powers and help you to develop them. One day you're going to English class or sitting in the hallway eating lunch with your friends, and the next day you're saving those friends and yourself from the powerful and deadly Unseelie.